Keeping with the steady growth and adoption of renewable energy, the latest Energy Infrastructure Update report just released from the Federal Energy Regulatory Commission’s Office of Energy Projects states that wind, solar, biomass, geothermal and hydropower accounts for 55.7 percent of newly installed generating capacity in the U.S. for the first half of 2014. Of the total 3,529 megawatts (MW) installed, 1,965 MW came from renewable sources, fully one-third of that, 32.1 percent, came from solar, with 1,131 MW of new solar generating capacity installed so far this year. 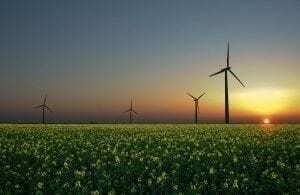 Wind energy follows with 19.8 percent of the total, or 699 MW of new capacity, followed by biomass with 87 MW (2.5 percent of total), geothermal with 32 MW (0.9 percent) and finally 16 MW from hydro (0.5 percent of total). According to the FERC report, natural gas provided most the balance of new generating capacity in the first half of the year with 1,555 MW, accounting for 44.1 percent of newly installed generating capacity. There was no new coal or nuclear capacity installed. The growth of renewable energy in 2014 continues the trend of renewable energy as an increasingly dominant source of new electrical generating capacity in the United States. For the past 30 months, since January 1, 2012, renewable sources of energy has provided nearly half – 48 percent – of all new generating capacity, bringing 22,774 MW online of the 47,446 MW total new capacity. Since January 1, 2011, renewables have contributed more new capacity than even natural gas – 31,345 MW vs. 47,446 MW – and almost four times as from coal, which only accounts for 8,235 MW of newly installed generating capacity. Two years ago, in June of 2012, renewable energy sources accounted for 14.76 percent of total installed generating capacity in operation. Today renewable provide 16.28 percent, more than nuclear and oil combined. Yet the EIA continues to downplay and underestimate the growth of renewable generating capacity. Given the evidence of the past months and years, it is clear that the long-term future of energy, and thus a sustainable and thriving economy, is with renewable sources of energy. The transition will not happen overnight, but it is happening faster than many said it would.